Accident victims who suffer a serious burn injury can face a long and costly road to recovery. This type of trauma causes acute physical and mental suffering, and can have permanent, disfiguring effects. A burn injury attorney can help you pursue legal compensation to cover medical expenses, replace lost income, and more. The Foley Law Firm in Scranton, PA, focuses on pursuing maximum monetary recoveries for victims and their families. Call (800) 523-6539 or send us an inquiry online to schedule your free case review. Burn injuries are common. They can occur at home, at work, and in motor vehicle accidents. Any type of sustained contact with open flames, scalding liquid, electricity, or caustic chemicals can cause a damaging burn. Classified according to the depth and degree of injury to skin and tissue, second and third degree burns are the most serious survivable burn injuries. A woman who was burned in a propane gas explosion achieved a $1.2 million settlement with our help. 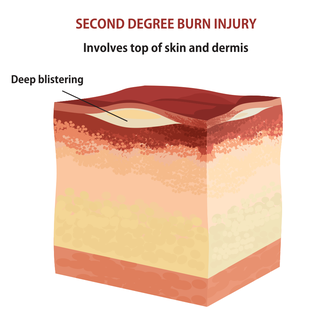 A second degree burn, which extends beyond the outer layer of skin, is typically very painful, but will not generally cause permanent damage. Depending upon the extent and area of the body affected, this injury may require several weeks of downtime. In some cases, skin grafting will be needed to repair damage to the skin. Third degree burns are extremely serious, and sometimes life-threatening. There may be significant damage to underlying tissue and internal organs, as well as blood loss and infection. The victim can face long-term hospitalization, with treatment that can be grueling. In most cases, surgery is necessary to minimize scarring and prevent dangerous complications. Often, a burn victim can no longer remain employed, even as medical expenses soar. There may be devastating changes to the victim's appearance, which can have far-reaching effects on lifestyle and self-esteem. Many burn injury accidents are the result of negligence. If a victim is burned in a fiery car or truck accident, the driver or his or her employer may be liable for the damages. When a burn event happens at home, the case may involve product liability or premises liability. For example, if a faulty smoke alarm results in injury, the manufacturer could be held liable. However, if the owner of an apartment fails to properly maintain his or her property, and this negligence results in a burn injury to a tenant or other occupant, there could be grounds for a premises liability suit. Sometimes, burn injuries are the result of malfunctioning machinery and inadequate safety standards in the workplace. Claims can fall under the workers' compensation umbrella, or involve third-party liability. There are also burn injury cases that are considered medical malpractice. This could apply to a cancer patient who receives too much radiation. Burn victims are often entitled to substantial compensation for their injuries. At Foley Law, we thoroughly understand these cases, the long-term damages, and the type of compensation due. Our firm has the resources to handle these complex cases, and has helped many burn victims collect due restitution. For example, a woman who was injured in a propane gas explosion achieved a $1.2 million settlement with our help. It is our policy to handle personal injury cases on a contingency basis, which means we collect nothing unless you receive a settlement or jury award. For a free consultation, please call (800) 523-6539 or contact us online today.